When this card is Xyz Summoned: You can discard any number of cards; increase this card’s Rank by 1 for each card discarded. Once per turn, if this card has Xyz Material: You can target 1 monster in your GY; detach all materials from this card, and if you do, attach that monster to this card as material, and if you do that, this card’s Type and Attribute become that material’s original Type and Attribute. Outer Entity Nyarla is…well, it’s a card. Generic Rank 4 that can change its Rank equal to cards you discard. Giving up resources for something further down the road and not instant gratification isn’t something you like to see in an effect. Changing the Attribute and Type of this monster can work for some strategies, but giving up all your Xyz Materials to attach a monster in the grave as a material is still a -1. This card combos with another Outer Entity monster we’re reviewing tomorrow, but I still don’t see why this card would be anything you’d want to run. You are losing cards to set up a move that will require several cards, and your opponent has a HUGE card pool in the TCG to work with to shut down any one of the steps you take to get there. D.D. Crow takes away your target in the grave, Skill Drain kills you, Veiler hurts you, Strike takes you down during any of these effects, it’s too much to go through. On top of that, you don’t have any ATK, but a decently strong DEF. Outer Entity Nyarla is a Rank 4 Earth Fiend-type XYZ Monster with 0 Atk and 2600 Def. Those stats aren’t great. I mean Earth Fiend? 0 Atk is terrible but at least the Def is ok. From the summon of any 2 Level 4 monsters you get Nyarla that can cards from your hand to increase its Rank by the number discarded but only upon XYX Summon. Ok, for Rank up purposes that might be ok except the cost is ludicrously high. To get anywhere good you need to have summoned this and discarded cards and then use another card and hope that nothing gets stopped. As a second effect, you get to ditch all of your XYZ material to pick a monster from the grave to attach as new material. Nyarla’s Type and Attribute change to the new material’s Type and Attribute. At least the cost isn’t so bad, but the effect sets up other cards. Nyarla itself is left wanting for some protection or a grave float effect. Oh well, not all gods are created equal. The final Entity cards that were in the OCG for 4 years are finally in the TCG now and we are reviewing one of the better cards they have today, Outer Entity Nyarla. Nyarla is a Rank 4 EARTH Fiend with 0 ATK and 2600 DEF and requires 2 Level 4 Monsters. The summoning conditions are generic and Rank 4 is the best Toolbox Rank. EARTH is solid and Fiend is good, 0 ATK is laughable but it makes up for that with a nice 2600 DEF. When Nyarla is XYZ Summoned, you can discard any number of cards from your hand to increase this card’s Rank by 1 per card discarded. Not the most useful effect, but has some cute niche uses. Once per turn, if this card has XYZ Material, you can detach all the materials on this card target a Monster in the GY and attach it to this as material instead and make this card’s Type and Attribute the Type and Attribute of the monster you attached to this. This can be neat to loop some GY effects, Herald of the Arc Light comes to mind in Nekroz, and that deck doesn’t care about the Extra Deck too much. The changing of Type and Attribute can also help for some niche Rank-Up plays along with the Rank boosting effect I mentioned earlier. This card also has it’s own Rank-Up monster that we’ll review tomorrow that you don’t need a Rank-Up Magic for. Nyarla has some niche uses, but they are some solid uses and being the stepping stone for a better XYZ gives it a solid score. Art: 4.5/5 Yeah, I don’t think I want to know what this thing is. As we look at an XYZ Monster today, Outer Entity Nyarla is a Rank 4, Earth Monster, with a glaring 0 attack, but a beastly 2600 defense. Nyarla is XYZ Summoned generically with 2 Level 4 Monsters. So, what do we get for a Monster with 0 attack and a tremendous defense? Hopefully something really good. 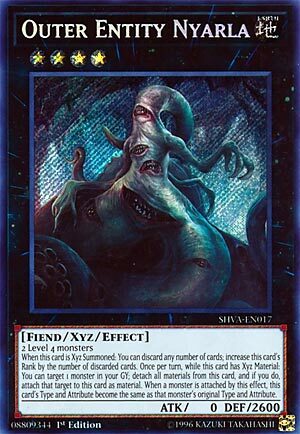 When XYZ Summoned, you can discard any number of cards to increase this cards Rank by 1…obviously we see this is a combo card, by doing so, you can (even perhaps at a large cost of discard) make this be a much higher rank card. Making this easier to XYZ Summon an XYZ of a high(er) rank, probably something 8 or above, and saving you the trouble of getting two Monsters of a high Level on the Field. But for another trick, if this card has XYZ Material, once a turn you can detach ALL XYZ Material from this card to Target a Monster in your Graveyard and have Nyarla become that Type and Attribute as the Monster you chose in your Graveyard. Said Monster also becomes attached to this card as new XYZ Material. So it can manipulate its Rank, Type, and Attribute. It’s a wonderful combo card, but it’s not game breaking, in my opinion. It certainly can, or at least should, make it easier to be splashable in many Decks that do have very specific XYZ requirements (and that does stop people from playing certain XYZ Monsters). It won’t necessarily do that much on your own, and it’s dependent on your Hand, as well as your Graveyard, to a degree. But I still like the potential.